Yesterday, Delish.com posted an article about a petition being put forth by Vegans, complaining that Starbucks needlessly puts condensed milk in their pumpkin spice latte mix. Because of the condensed milk in the mix, it is impossible to make a Vegan pumpkin spiced latte. Other lattes offered by Starbucks use mixes that dont contain dairy products and can therefore be made with milk substitutes to produce a Vegan version of the beverage. See http://www.delish.com/food/recalls-reviews/vegans-petitioning-starbucks-pumpkin-spice-lattes?src=soc_fcbks. I reacted to this story in a way born of ignorance. I wanted to publicly present my "mea culpa." I blew this one on so many levels. Let me hereby apologize for any aspersions I may have cast on Vegans or their traditional fall consumption of pumpkin spice lattes. I did more research on the matter and learned a number of things that I had not known. First and foremost, it turns out that the Pilgrims were Vegans! Wow. That explains a lot! Furthermore, the tradition of consuming “pumpkin spice lattes” was introduced to the Pilgrims during the famous First Thanksgiving. It was, in fact, Chief Starbuck himself, leader of the Massachusett Indians, who brewed the first pumpkin spice latte ever tasted by a European. It occurred on that fateful day of sharing and celebration in 1621. Furthermore, it turns out that the word “laghtee” is a Wampanoag word (adopted by the Massachusett) meaning “any type of frothy liquid, especially a beverage.” It was over two hundred years later that Italian Americans brought the Anglicized word “latte” back to Italy (along with the use of tomatoes in pizza.) Later, during WWII, riding the wave of Italian wartime nationalism, the similarity between this corruption of “laghtee” and the Latin “lactis” resulted in the creation of the myth that the “latte” was an Italian creation. This myth has spread far and wide despite numerous failed attempts by descendants of the Massachusett and Wampanoag to reclaim their rightful beverage history. Needless to say, the “spice” in the original pumpkin spice latte was not the combination of cinnamon, nutmeg, and cloves that we think of today. The pumpkin spice latte was originally brewed with a powder made from the bark of the Gesundheit pine (Pinus gesundheit), known as “ahchoobangbang” in Wampanoag. Because of this, the pumpkin spice latte was a seasonal brew, since the pine only developed its distinctive flavor in the fall as the tree began preparing for the cold northern winter. The Gesundheit pine, named after famed 18th C. German botanist, Dr. Freidrich Gesundheit, went extinct in the early 1930s, not long after the discovery of penicillin. As a result, we now make our pumpkin spice latte with a mixture of “spice island” spices. 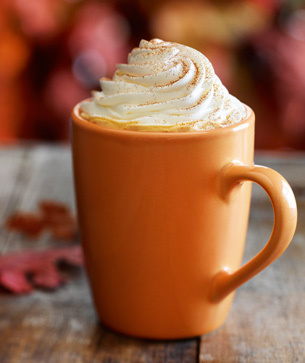 Apparently, drinking pumpkin spice lattes in fall has been a dearly held tradition among American Vegans, linking them to their Pilgrim ancestors. Furthermore, by surreptitiously adulterating their pumpkin spice latte mix with condensed milk, the Starbucks Corporation is guilty not only of depriving Vegans of this important fall beverage, but also of co-opting and perverting yet another Native American tradition. Not only has the Starbucks Corporation stolen and sullied the name of one of the greatest chiefs in Massachusett history (for which they have never provided ample compensation.) Not only are they earning huge revenues from the very brew that Chief Starbuck gave as a gift of peace to the Pilgrims. But, as if that weren’t enough, they are needlessly corrupting this traditional drink in a way that makes it unfit for the very people to whom it is most meaningful, further commodifying and distorting early American foodways. My apologies for suggesting that Vegans should not work to protect this significant beverage. My comments in reacting to the original story were the result of an inexcusable ignorance of the true facts in this matter. I hope that this will serve as ample compensation for my earlier unfeeling words. Note: for more important information on American culinary history you can learn about the Pie of July celebration here.